Even though it doesn't obey any earthly speed limit and has a space-suited mannequin for a driver, Elon Musk's Tesla Roadster won't drive up his insurance rates anytime soon. Researchers say the orbiting sports car won't have a really close encounter with Earth until 2091 and could last millions of years before getting totaled in a planetary crackup. Launched atop a SpaceX Falcon Heavy rocket last week, the Roadster was boosted into an elliptical orbit around the sun. It will pass within about 68.7 million miles of Mars on June 10 and cross the red planet's orbit in July before reaching its farthest distance from the sun -- 154.7 million miles -- on Nov. 9. 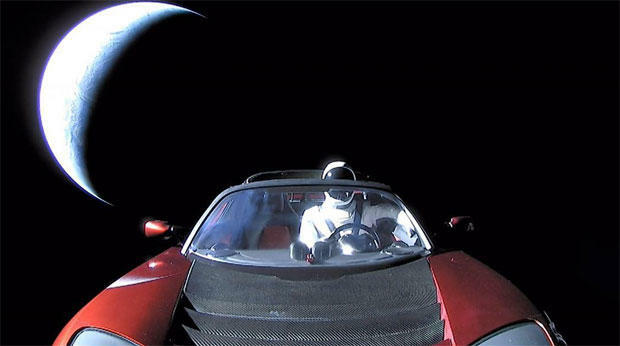 The Roadster and its mannequin driver -- known as Starman -- then will fall back toward the inner solar system, picking up speed as they near the low point of the orbit, or perihelion, on Aug. 15, 2019. Perihelion in this case roughly matches the distance of Earth's orbit from the sun, the Tesla's starting point. The Roadster then will head back out along the same path, traveling a now-familiar route over and over again for the foreseeable future. But a variety of factors will act to change the trajectory over time. Analyzing the Roadster's orbit, three astronomers who specialize in planetary motion -- Hanno Rein, Daniel Tamayo and David Vokrouhlicky -- write in a paper posted at arXiv, a repository of electronic preprints of scientific papers hosted by Cornell University, that the Tesla will have its first close encounter with Earth in 2091, possibly passing closer than the moon. Subsequent flybys are difficult to precisely model because of gravitational and other effects on the Tesla's trajectory, but the researchers say multiple computer simulations permit a statistical analysis that indicates the odds of a collision with Earth are very low over the next million years. "The bottom line is we can't predict with certainty what's going to happen after just a few hundred years, because it's a chaotic orbit and we can only draw conclusions in a statistical sense," Rein said in a telephone interview from his office at the University of Toronto. Based on multiple simulations, "roughly 50 percent are going to hit a planet in the next few tens of millions of years." Asked why he and his colleagues decided to model the Tesla's orbit, Rein said "we were very excited by the launch and ... as soon as the first orbital elements were published by (the Jet Propulsion Laboratory) we thought, well, let's see what happens to this thing. We're fully aware this is not going to open a new field in astrophysics. This was a fun thing to do." The Tesla should enjoy a long life in space, he said. The simulations show a roughly 50 percent chance of a collision with a planet over many millions of years, but a relatively small chance of hitting Earth in the next million. "The orbital evolution is initially dominated by close encounters with the Earth," the authors write in the paper's abstract. "The first close encounter with the Earth will occur in 2091. The repeated encounters lead to a random walk that eventually causes close encounters with other terrestrial planets and the sun. "Long-term integrations become highly sensitive to the initial conditions after several such close encounters," the abstract continues. "By running a large ensemble of simulations with slightly perturbed initial conditions, we estimate the probability of a collision with Earth and Venus over the next one million years to be 6 percent and 2.5 percent, respectively. "We estimate the dynamical lifetime of the Tesla to be a few tens of millions of years." Constant exposure to space radiation, micrometeoroid impacts and extreme temperatures will take their toll and the Roadster's resale value likely will take a beating. But that's another story.